Mauna Kea Observatory is the world's largest astronomical research facility. It is home to some of the most powerful telescopes in the world, aimed at space from atop the tallest mountain in the world. This astronomical research facility is ideally situated for studying space, high atop an island mountain in the middle of the Pacific Ocean. Nearly three miles above sea level and far from the interference of man-made light, the summit of Mauna Kea Volcano on Hawaii's Big Island makes a perfect home for the world's largest astronomical observatory. Mauna Kea Observatory is an international collaborative effort. 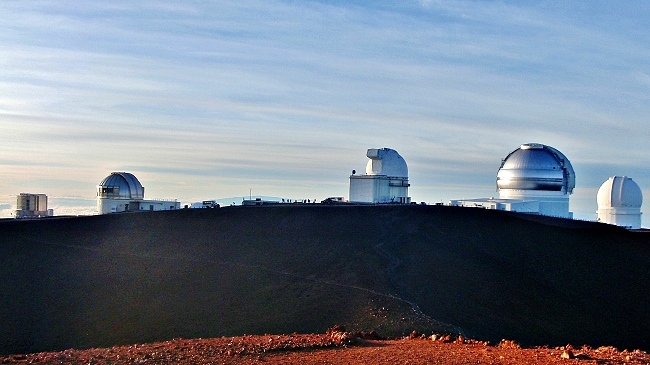 Astronomers from eleven countries currently operate thirteen Mauna Kea telescopes. The combined light gathering power of the Mauna Kea telescopes is far greater than any other telescope on earth, and 60 times greater than the Hubble Space Telescope! There are more major telescopes at the Mauna Kea observatories than on any other single mountain. The telescopes include Gemini Northern Telescope (a joint international effort between the US, Canada, Great Britain, Australia, Argentina, Brazil and Chile), Subaru Telescope (Japan), and Keck Observatory operated by the University of California/Caltech. 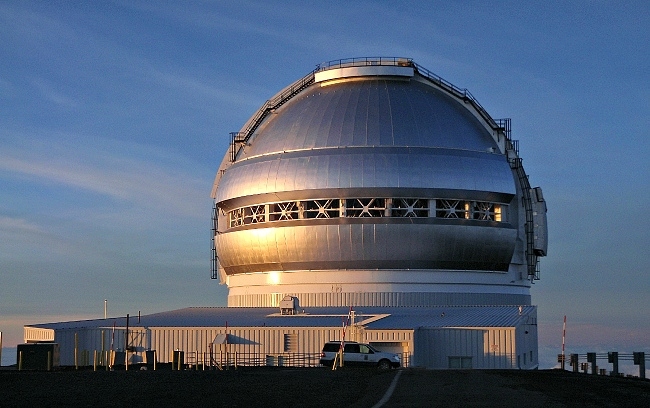 The Keck Observatory contains the largest optical/infrared telescopes in the world. The atmosphere above the mountain is extremely dry and relatively cloud-free, important factors for observing space and measuring celestial radiation. The proportion of clear nights is among the highest anywhere in the world. To aid astronomers in their night viewing, there is an island-wide lighting ordinance that helps to ensure dark skies at the Mauna Kea summit. There are very few bright lights on the island. Even street lights in the towns many miles below the mountain are a soft amber color to limit the amount of reflected light. Visitors should always be prepared for severe weather at the summit, particularly during the winter when snow is not uncommon. No matter what time of year, remember that just because you're in Hawaii doesn't mean it won't be cold and windy up here. 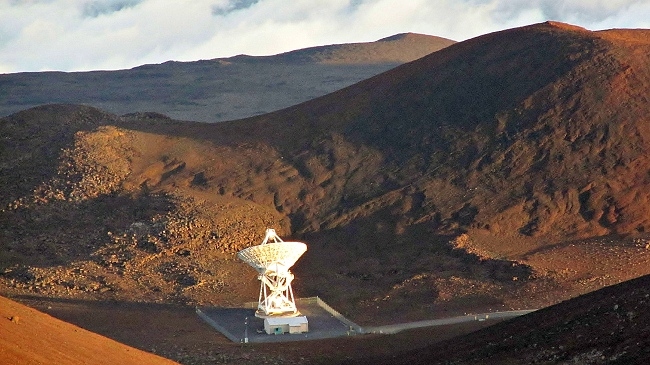 Mauna Kea is also part of the National Radio Astronomy Observatory. The radio telescope in the image below is part of the Very Long Baseline Array (VLBA), a series of ten identical antennas sequenced between Mauna Kea, Hawaii and St. Croix, Virgin Islands. The focus of the project is precision astrometry, or providing three dimensional measurements of the exact positions and movements of stars and other celestial objects. 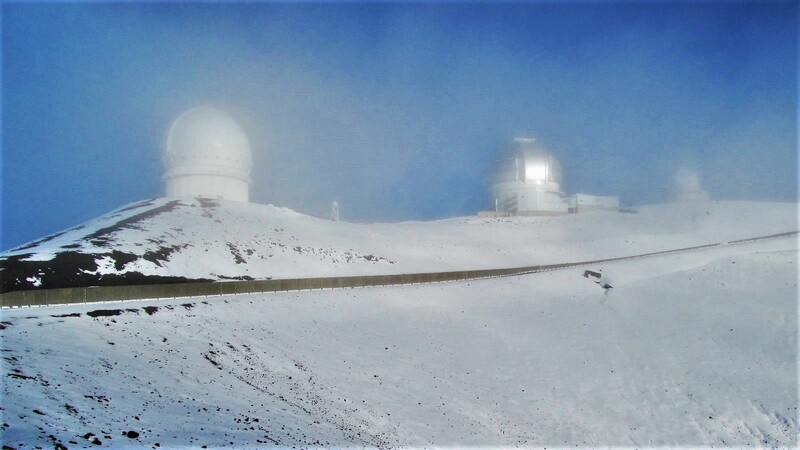 The Onizuka Center for International Astronomy is a mid-mountain facility that was constructed to allow scientists and technicians coming from sea level to acclimate to the high altitude. The International Astronomy Center was named in honor of local Hawaiian astronaut Ellison Onizuka who perished in the 1986 Challenger disaster. It includes a Visitor Information Station that is open to the public. The Visitor Information Station is the first stop on the Mauna Kea Summit Tour. 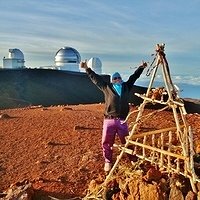 This tour is the best way to make the most of your visit to the Mauna Kea summit. The Visitor Information Station has a wealth of information about the Mauna Kea volcano, the summit observatory and telescopes, and space. There's a great little gift shop with souvenirs and snacks, and after dark there are portable telescopes available for star gazing. Before continuing to the Mauna Kea summit, visitors spend enough time here to get acclimated to the altitude. Enjoy your trip!